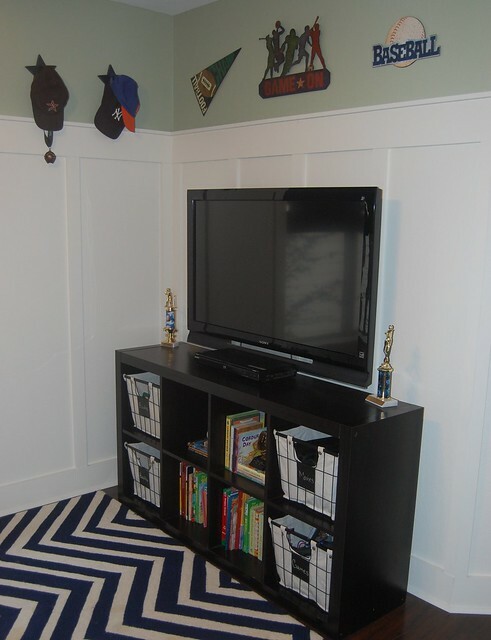 I didn't really have a plan of how I was going to accessorize my boys' gameroom after we remodeled. It's hard to make a decision since my three boys range from age 5 to almost 11, so their interests are very different. But, the one thing they all love is sports. 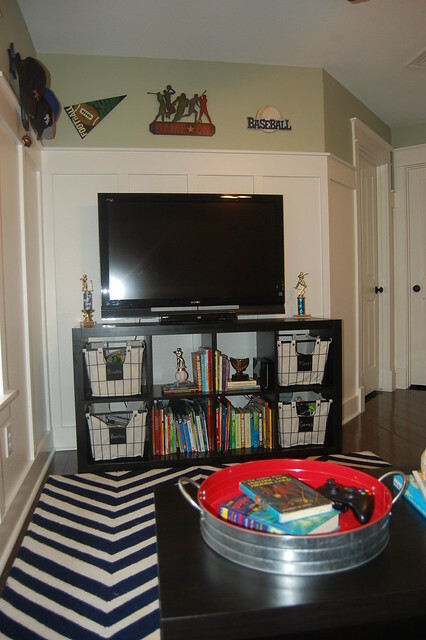 Not only do we love how the room turned out, but I get to actually do something with their millions of baseball hats and trophies. Here it is! This is the view as you walk up the stairs. The view toward the stairs and new desk area. 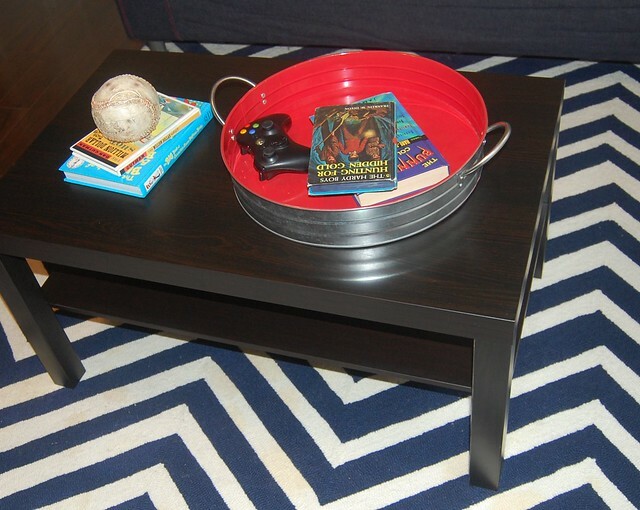 I was so excited to find this coffee table for $20 at Ikea. It's small, but perfect for the kids. If they destroy it then it won't be the end of the world either. The tray is from World Market and I initially bought it as a serving tray to use outside. 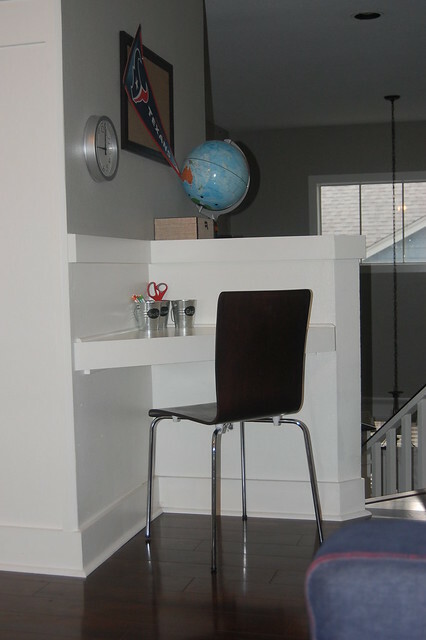 I realized it would be perfect in this room after we put the table in here. The kids can throw books and video game remotes in it, and it's crazy how everything looks organized just because it's in a tray. The baseball opens up and we're using it to collect the stray batteries. If you have boys that play video games you know exactly what I mean! I found these bins at Walmart for $10! I can't believe how perfectly they fit in the Ikea Hemnes bookcase. The chalkboard labels are nice, too. They also have very cool galvanized bins that are the exact same size if you are looking for an alternative to straw baskets. 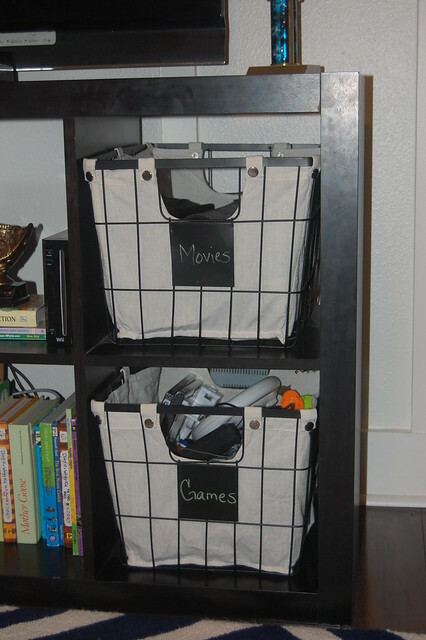 I am planning to buy the door inserts from Ikea for the four middle cubbies, but they were sold out when we went. It will hide even more of their stuff. It's crazy, but this is only a small fraction of their books. 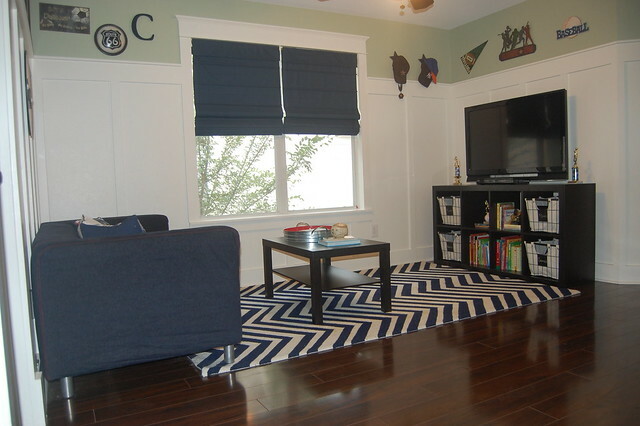 The metal signs above the tv are from Hobby Lobby and the star hooks were bought years ago at Pottery Barn Kids. 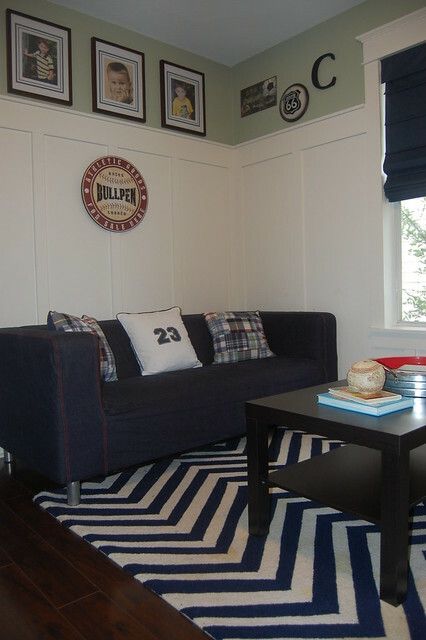 The Bullpen artwork above the sofa is new. I used Command picture hangers so I didn't have to put a hole in the brand new woodwork. The art is from Hobby Lobby along with the Clubhouse and Route 66 sign. The frames and "C' is from Pottery Barn Kids. 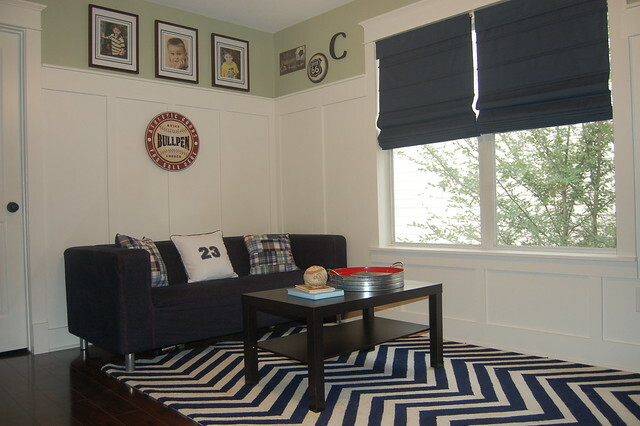 The throw pillows are all from PB Teen. I also added a few things to the study area. The kids haven't really used this area much, but I imagine once school starts they will do homework here. For now, we're just supporting the Texans. I want to add a few more things to this area to make it more functional. I'm thinking hanging files on the wall will be a perfect place for weekly homework packets. 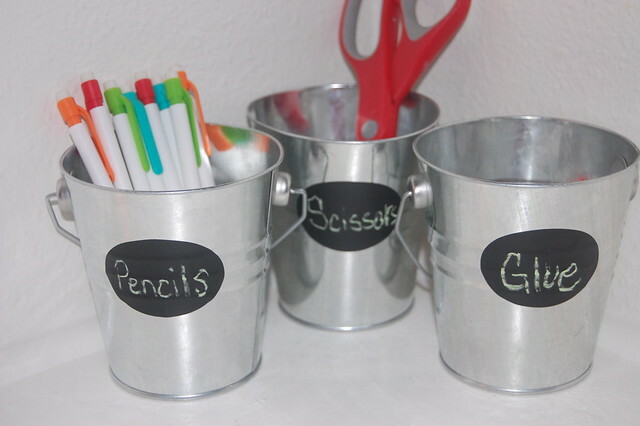 I bought the mini buckets and chalkboard labels in the Target dollar section. So cute! I almost put crayons in there and then came to my senses. I want my woodwork to stay white. There are a few minor details to work on, but it's pretty much done! Yay! Great find on the bins. Thanks for linking up!! What a useful room and I really like the little study corner. Those little bins with labels are cute and practical too. 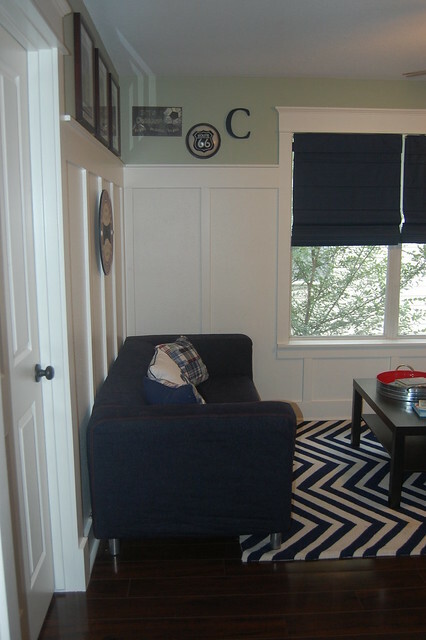 Love the chevron and the curtains. 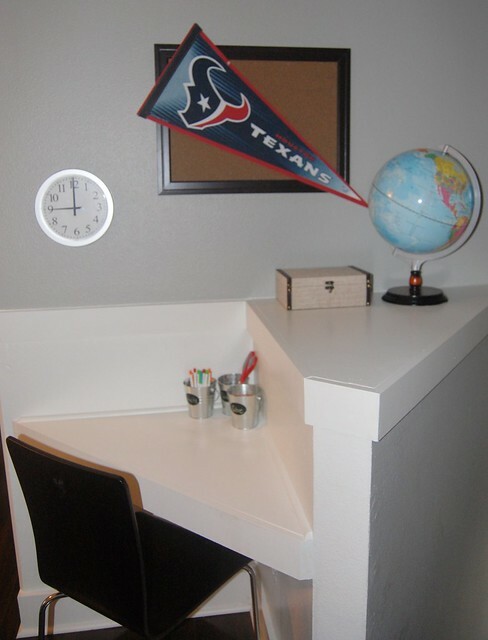 The corner desk is great too. Fantastic job! I'm sure your boys love it.